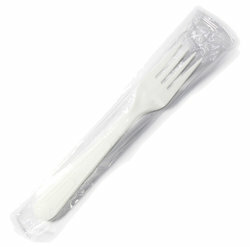 Full Size Plastic Utensils (Individually Wrapped - 250 Count). These utensils are full size and INDIVIDUALLY wrapped for sanitary purposes. Some companies offer bulk utensils, our customers are worth the small cost to ensure their safety. These are same utensils that OUR employees use everyday.